A joint George Cross Island Association/Neptune Association service was held in St Paul's Cathedral, Malta. Those who did not wish to join in this event were taken on a coach tour of Valletta where they visited the Grand Master's Palace and armoury. Later, we all embarked on a sea tour of the waters around the Valletta area, including the very impressive Grand Harbour. We experienced the 'history' of Malta; the Lascaris War Rooms,the Seige Bell, as it was ringing at noon, the Malta Experience, a depiction of the continuous development of Malta from its earliest times to the present day,through sound and film. 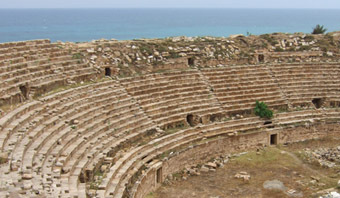 Visit to Leptis Magna, the ruins of a huge Roman city approx 80 kilometres east of Tripoli. The weather was very unusual for Mediterranean areas in that it rained heavily. A visit and service followed at the Commonwealth War Graves Cemetery in Tripoli which was attended by the British Ambassador, Sir Vincent Fean. The service was conducted by Father Robbie Prakasam, a Libyan Anglican priest. There are six named graves for Neptune casualties in the 1941 plot, surrounded by 20 graves marked "soldier known unto God". Since the only other graves were of aircrew, these too are probably Neptune casualties. We were invited to an evening Reception in the British Embassy, hosted by Sir Vincent and Lady Fean and attended by 100 guests including the Ambassadors of South Africa, Australia (representing New Zealand), Malta, Germany and Italy. We had the opportunity to talk to British residents of Tripoli and gain an insight into life in Libya. This was the event we had all been waiting for. The sea journey in Jarif, a Libyan Suction Dredger of 1500 tons, to the site where HMS Neptune probably lies.We slowly steered parallel with the old Italian minelane but half a mile to the East. The ship came to a stop at the point where Neptune probably lies. We lowered a white ensign presented by the current HMS Neptune in Faslane, and one to represent the New Zealand men who were on board. Wreaths were laid for Neptune and Kandahar and 250 flowers were cast into the sea in honour of relatives and friends who had died. Norma, daughter of the one Neptune survivor Able Seaman Norman Walton, scattered his ashes in accordance with his wishes. Norman Walton died in 2005. Unveiling Ceremony at the Malta Maritime Museum in the presence of the President of Malta, HE Dr Edward Fenech Adami. A Scroll of Honour listing 836 names of those who died, was presented by John McGregor to Dr Mario Tabone, Chairman of Malta Heritage. 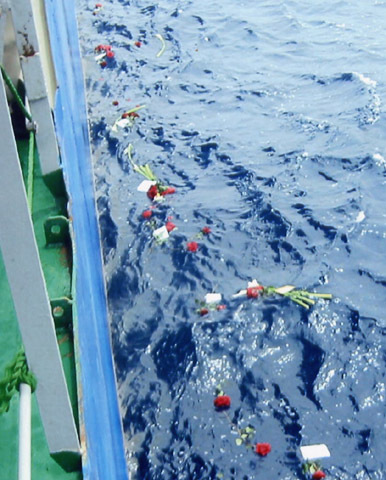 Dr Fenech Adami then unveiled a plaque commemorating the Neptune tragedy. I have collected some comments from several people who took part in the visit. They tell of the feelings and emotions felt during the days we were in Malta and Tripoli. and Ian Grieve, my own father, thwarted of a Navy career by the cuts of the 1920's which led to the Invergordon Mutiny, RNVR officer and amateur naval historian who named me for family friend and his hero, Captain O'Conor'. 'My wife, Frances and myself really enjoyed the experience of the Remembrance trip to Malta and Libya. I am sure I speak for most people when I say thank you to all concerned for making it a trip to remember. The most moving point for me was the ceremony at sea. To think that my father (Marine Ronald A Dubber) was just below us. I only wish my brothers in South Africa could have lived long enough for me to have told them of the voyage. I was proud to wear my father's medals on this occasion, which my brother Joe had given me on our holiday to South Africa eighteen months ago. It was so nice to have met such nice people in the group. Hopefully we have made some friends which we will be in contact with'. 'I made this remembrance pilgrimage to represent my family, especially my mother (now blind and unable to make this trip) and my late father whose only brother perished in the Neptune Tragedy. This has helped bring closure and a sense of deeper peace for us through fuller understanding and appreciation of the environs and circumstances in which this disastrous tragedy occurred so far away from New Zealand. I feel very privileged and blessed to have experienced the warmth and friendship of the relatives of other Neptune and Kandahar victims from around the world. Words fail me to express the close bonds of friendship and unity that have developed for me through this truly incredible 9 day journey. It is indeed unimaginable to believe that such deep affection and empathy between the relatives of the victims of such a tragedy 66 years after such a tragic event could ever develop. I will cherish this once-in-a-lifetime experience and some lifelong friendships forever. Thank you to everyone for making this all possible'. 'When my Mum and I arrived at Heathrow, at the start of our journey, I must admit that I was slightly wary of going on this trip. I have not been involved with the Neptune Association and I didn't know anyone else, apart from my Mum. I thought it would be likely that I would be the 'baby' of the group, at 40 years of age! And so it was. On arrival at the check-in I felt like I was going on a SAGA package holiday and true enough, there was a lot of beige being worn! I soon found, however, a wonderful group of people who were extremely warm and engaging with each other. All sorts of people from all walks of life,brought together by this one common factor. The trip could have been very sombre, but it was full of joy as well. I made some great friends. I recall walking down to Sliema for a few bevies with my two mates, Frank and Geoff. Just 3 lads having a saunter, chatting and telling jokes. ( Not to be repeated here!). But of course, one of them was there in 1941, another lost his Dad and the third, his Grandad. What an extraordinary connection, but also how normal to just be getting along so well. My Mum and I also got along fantastically which I never doubted anyway. The first time we had been away together since I was a child. My Dad was going to come along but felt it more appropriate if it were just us two. He has attended meetings and services. I found the trip out on the Jarif very emotional. I might just explain how I felt. Since I've been a small child, I've been brought up with the story of my Grandad who died in the Med. A working man of 23 from London, recently married and with a 2 year old daughter. He wasn't highly educated. His life revolved around working, looking after his family and having a few pints. Undoubtedly. he would probably never have heard of Malta, Tripoli or even the Med, and then all of a sudden, soon after joining up, he's dying in the Med off the coast of Libya. It is this sacrifice that I feel is so moving. Whilst I was away for the one week I was missing my two year old son and his mother. My son also being 2, and being out at sea, albeit on a dredger for only a day, and in peacetime, and in the same location, really made me appreciate what Fred and his shipmates were doing at that time. One funny recollection I have is of looking down from the bridge and seeing the ladies preparing the flowers aft of the dredging compartment. The three sisters and two more ladies sitting resolutely with the ship rolling, water sloshing, preparing the delicate flowers. To my mind it looked like a WI meeting at sea, and indeed I did ask where the jam and the sponge cakes were! It seemed to me to demonstrate in a small way, that indomitable spirit, even eccentricity and bloody-mindedness of the British and our Commonwealth allies. That evening, after going out on the Jafid, we enjoyed a great meal and entertainment. In effect it was like a wake. The musicians were very loud and the dancing girls were very .................... as well. I put aside my normal reticence to dance and followed Keith Evans example when I saw him dancing like a Red Indian. If this how we were to round off the day after we had paid our respects, so be it. I know from what I have been told that an old-fashioned working class London wake would be quite a rowdy affair. So I'm sure my Grandad would have found it fitting. That week away felt like a lifetime. So much in such a short time. Literally, with all the tours etc but also the emotion and meeting so many new friends. How must our lads have felt as part of a ship's company after months together. Their mates would have become their family at sea. This I find a comforting thought'. 'We were now to go to sea in a dredger, much bigger and more stable than the little 'Barbarousse' which had been the first choice. The weather overnight had become calmer than yesterday, for which we were grateful. We set out at about 11 am, local time. The conditions became more choppy after we had cleared the breakwater, but there was absolutely nothing to worry about. As we neared the site where we believe Neptune to lie, the ship slowed down and stopped. The service began with prayers and readings. Then, the Naval Hymn. I knew I would not be able to sing this hymn with any sort of composure, so I turned away, and looked out at the sea and sang as loudly as I could into the elements. I looked at the sea, which looked much like any other stretch of sea we had sailed through, and I wondered what was beneath us. I hoped so much we were over Neptune. The service continued with immense dignity whilst we held the Silence, said prayers, and began our tributes. The White Ensign was lowered into the sea by John McGregor and Nick Wright, then Royden and Sandie Thomson lowered the New Zealand ensign. Wreaths were laid in the water for the men of HMS Neptune and HMS Kandahar followed by those from other organisations. Individual tributes of single flowers were cast into the sea in memory of relatives and friends of those present, and of those who were unable to make the journey with us. We all fell silent as Norma Hudson, daughter of Norman Walton, scattered her father's ashes in accordance with his wishes. The service ended with the blessing. 'It was my Dad's wish that on his death he wanted to be returned to the Mediterranean Sea to rest in peace with the shipmates he left behind. I did not envisage, when he made the request, that such an opportunity would be possible. The trip to the site where HMS Neptune could have gone down made it possible. I felt very privileged to have been allowed to fulfil his wishes in such distinguished company. I would like to thank everyone concerned in organising such a unique trip and I would also like to thank the relatives of Dad's shipmates for allowing me to share in their pilgrimage. I hope the friendships we have made with continue to flourish'. 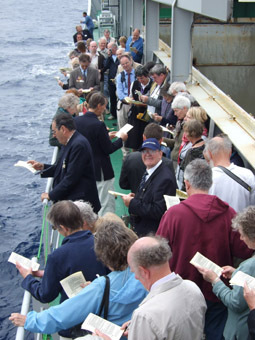 'When The Neptune Association came into being, it was a very heartwarming time, and its progress in these few short years has been very fulfilling, so it is not surprising the feelings I had when I found out it was to hold a Remembrance Journey to to the place which had been the site of so much sorrow to so many people. It had at times through the passing years, been a thought that I had personally held, but it had not seemed possible, and then, by the dedicated work of the few, it became a reality. Now was to be the time when I could do something that, had it been in the lifetime of my parents, would, I feel have helped to a small degree lift the dark shadow that came upon the family when their son, 'Bill' William, Ordinary Seaman, my brother, was lost that dreadful night. Ironic that, after years of pleas to go to sea, my parents relented and that after passing from a training school into the Royal Navy to the life he loved, in a few short months the sea would claim him. So it was that I would go on a ship with others of a like mind, to that place, and to stand on the 'bridge', as he had said in the exuberance of his few letters that we would receive, and to visit Malta, where I think they they had hoped to spend Christmas had not that urgent call gone out . 'After 18 months of hard work in putting this Tour together, the most challenging part being the arrangements in Tripoli, we are delighted that we achieved all that we were asked to do. Who would have thought that an excursion out to sea for such a special commemoration could have been such a triumph on a dredger! What a pleasure it was for me, to have the honour of being part of your special moments; the joy of such a happy group bonding together like a family and to share the sadness and emotion, particularly on that day at sea. 'When I received my annual RBL Remembrance Travel brochure and read the story about the Neptune Association's visit to Malta and Libya, it interested me straight away and so I decided to book for it, and am pleased that I did so. I feel the tour was well thought out, with a combination of sight seeing and the actual act of remembrance. Naturally, I feel that the centre of the trip was taking the boat journey out to to the site where it is believed the ships went down. I thought the service on board was quite moving with the lowering of the England & New Zealand Ensigns, the casting of two wreaths, the floral tributes and, lastly, scattering the ashes of Petty Officer Norman Walton, by his daughter, Norma. After this, there was silent reflection for people to have time to say their last goodbyes and ponder over their own thoughts. The service at the Tripoli War Cemetery was also very touching. Before and after the service, we were given time to walk around the cemetery. Then it was on to a Reception at the British Ambassador's Residence. On leaving the Reception, I noticed a biggish fruit bowl on a stand where the Ambassador and his wife were saying their farewells to us all. I asked if they needed a contribution towards the evening, and if so, was that what the bowl was in aid of; they both laughed and the Ambassador said that our taxes would be sufficient. It was then back to Malta for the last two days, where, for the first time in all my travelling to various destinations over the world, my suitcase did not turn up. So, it was a mad dash to the shops in order to purchase a new outfit for the Saturday morning event. This involved a visit to the Kalkara Naval Cemetery, then onto the Vittoriosa Maritime Museum for a Plaque Ceremony, short service and reception. I feel honoured to have been on this trip and was thanked by many people for coming on it, although I had no direct involvement. 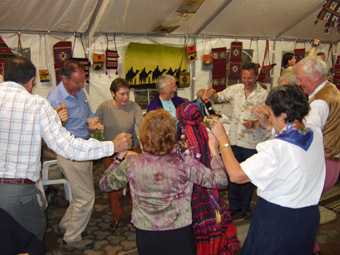 The camaraderie was very good, with everyone looking after each other and lasting friendships being made. The trip was a mixture of tears, reflection, saying last goodbyes, but at the same time, being able to laugh, joke and enjoy oneself. And, yes, I did get my suitcase back'. If anyone who came on the visit to Malta and Tripoli would like to add their own personal thoughts and experiences, please contact Diana Clayton (co-ordinator), by e-mail to the address below, or write to Diana at 5 Hadfield Cross, Hadfield, Glossop, Derbyshire SK13 1NT (Tel: 01457-861606).